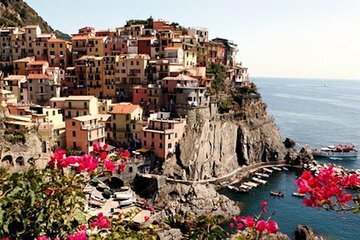 Massimizza il tempo nella costiera delle Cinque Terre in una visita guidata privata di un'intera giornata. L'itinerario combina convenientemente il trasporto in un furgone Mercedes con un giro su un traghetto panoramico e un tour a piedi del villaggio. Esplora i cinque affascinanti villaggi delle Cinque Terre in modo indipendente con tempo libero per visitare la città. Assaggia vini locali durante una degustazione e visita la famosa "Torre pendente" durante una sosta a Pisa. Our driver spoke poor English and didn’t offer much in the way of narration on our way to our destination. He dropped us off at the first village, again without much direction. We were able to figure out the ferries between the villages and had no problem with that. When we arrived in the last village, he was no where to be found! He had showed us a picture of the hotel he would be waiting with the car. We couldn’t find it!! Hot, tired and a little frustrated, I called him. We finally connected. Silent ride back to port...defiantly no tip! What a great and memorable day. We had three 8 passenger vans for our excursion to Cinque Terre. All three drivers were professional, courteous, and knowledgeable. They drove us straight to riomaggiore where they dropped us off to explore on our own and take the ferry over to Monterosso. This enabled us to go at our own pace and get to the pick up point a few hours later. The Ferry ride over had the best views you can imagine. Definitely the best way to see Cinque Terre. Our drivers then picked us up and drove us to Corniglia, another village that you can not get to by boat. A beautiful village on the top of a cliff with great views. We had about an hour there to tour and grab a quick glass of wine. On the way back to the boat we were able to stop in Pizza for about 30 minutes to take a few pictures before heading back to the boat. I would highly recommend this excursion to anyone. AWSOME experience!!! !The guide was very friendly and professional, he allowed us to spend free time in the places we liked the most, which made the day very nice and relaxing without the typical excursion rush. A MUST do! We did Pisa first thing in the morning before it got full of other tourist and it was perfect to then spend most of the time in Cinque Terre, which was breathtaking.